In Philadelphia, they battle from shop to shop over who makes the best Cheesesteak Sandwiches. The one thing that most of them have in common is that piles of tender beef, peppers, and onions are topped with some version of a cheese sauce. We rednecks in Alabama have a better cheese sauce…Velveeta! 1. Spread each side of the split sub rolls with a little softened butter. Heat a griddle or large skillet over medium heat and place the rolls, buttered side down, as they will fit on the griddle to toast. Remove from the heat and cover to keep warm. 2. In a large skillet over medium heat, warm the remaining butter with the olive oil. Add the pepper and onion strips and cook, stirring frequently, until tender. 3. While the peppers and onions are cooking, prepare the cheese sauce. In a microwave safe bowl or glass measuring cup, melt together the milk, Velveeta, pepper, dry mustard, and cayenne, stirring until smooth. 4. In a large sauce pan, heat the au jus to a simmer. 5. To assemble, using a spider or wire strainer, dip the roast beef into the simmering au jus to warm just a bit. Allow the excess jus to drip back into the pan. Reserve for another use if desired. (Think French Dips.) 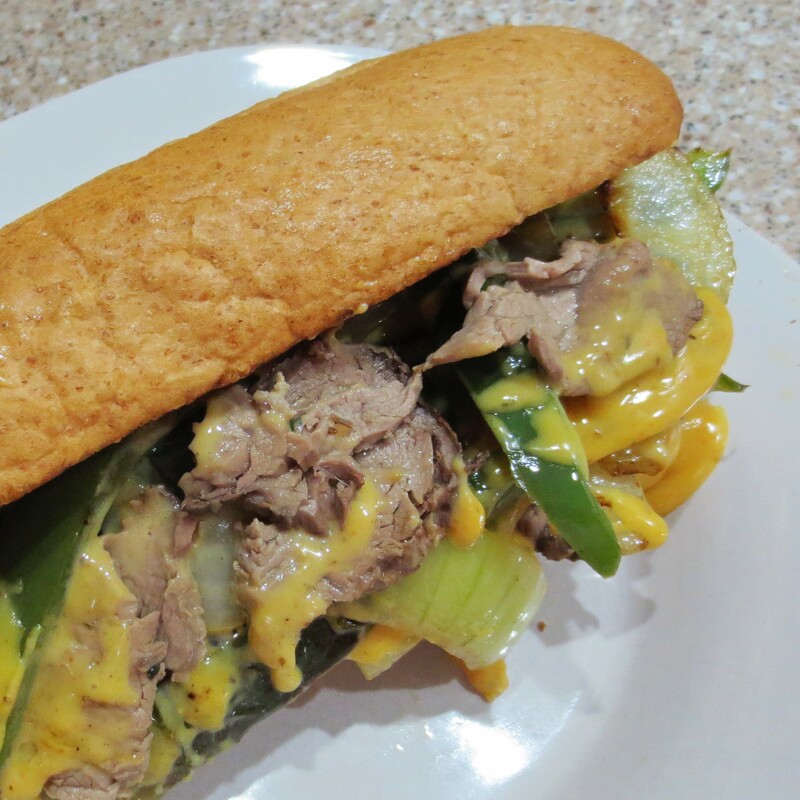 Pile a quarter of the warmed beef on the bottom half of each sub roll. 6. Top the beef with a drizzle of the cheese sauce on each sub. 7. Divide the peppers and onions between each and top with the remaining sauce.